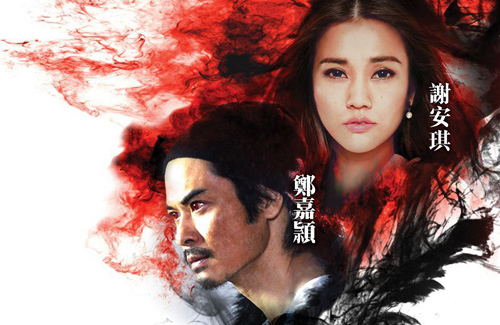 TVB has released the synopsis of its upcoming supernatural series Blue Veins <殭> (previously known as The Vampire), starring Kevin Cheng (鄭嘉穎) and Kay Tse (謝安琪). Produced by Joe Chan (陳維冠), the drama boasts a refreshing cast, including Grace Chan (陳凱琳), Wong You Nam (黃又南), Eddie Kwan (關禮傑), Joel Chan (陳山聰), Luk Wing (陸永), Winki Lai (賴慰玲), and Anjaylia Chan (陳嘉寶). After getting struck by lightning during the The Great Vampire War, Ying Wuet Tseuk (Kevin Cheng) and his gang of thieves become The Undead, a race of immortal beings. For the next 500 years, Ying Wuet Tseuk kept his identity hidden and secludes himself in the city, spending sleepless nights managing a late-night food hall. Skilled in martial arts, Ying Wuet Tseuk also operates a martial arts training hall and accepts two disciples under his wing. Ying Wuet Tseuk is in love with forensic scientist Lam Mung Nam (Kay Tse), a vampire who had her memories and powers completely sealed away. Unaware of her vampiric identity, her only remaining power is the ability to revive the dead for one minute. For years, Ying Wuet Tseuk stayed by her side silently, helping her piece memories back together one by one. But nature is always working against them. The Vampires and The Undead are mortal enemies, and it is a sin for these beings to be together. Despite the obstacles, Ying Wuet Tseuk is still willing to sacrifice his life to save Lam Mung Nam. Hovering between the thin line of life and death, the star-crossed lovers discover a grave secret about their past—that the origin of The Vampire and The Undead is actually from the future. looking forward to something difference. fRESH casts! Any vampire series should have Joey Meng in it. Pairing her with Kevin Cheng would have been better. But it would be funny seeing her without Eric Wan. Finally a new refreshing storyline. Not like those storyline that’s used over and over again and then remakes after remakes. I would definitely check this out. It may sound refreshing on paper but don’t count on tvb scriptwriters not to screew it up. Surely the vampire will know something is not right with her whenever she starts burning in broad daylight? Or is this like the terrible version of Twilight where they sparkle? Well talk about glamorous job being an immortal eh? Story is not new or refreshing and TVB is riding the whole undead thing a little too late. Why is this awaiting moderation?! Whatever is that offensive word? Twilight? Sparkle? Burning? Broad? Simple,daylight rings like Vampire Diaries or take some pill to avoid the cravings of blood (Since she is a forensic scientist). Late yes, since Koreans, Americans, and etc had already explored the idea. Nevertheless, it is a refreshing take, for TVB who rarely does something out of ordinary. In todays media world where subtitles and sattelite Broadcast has broken down barriers, the idea presented here may be novel to tvb but not to the viewers. But a lot rides on the chemistry between the two leads and less bloat. But vampires that can stay in the daylight is to me the dealbreaker. I hope this series will address the issue smartly. Because it is just ridiculous. Funn, the idea that vampires cannot stay in bright daylight was also invented by some writer. After all who can decide what vampires can or cannot do? Its all up to the story writer. Blood+ and Vampire Knight (both japanese anime) have vampires that can stay in daylight. this sounds insanely boring…shall wait for next series. Different but boring – can we expect Kevin to act in love with his serious face on too (same expression in Eye in the Sky atm) and his puzzling one for helping Kay figuring out her out identity and powers? Seems like a cross between tru calling and twilight. Might check it out when it is shown. Refreshing but not true story in life . I don’t like fantasies drama or movie .We living in the new century .,,everything true but true . Tvb just waste Kevin ‘s acting. What a boring , what a waste time and a money for such that drama. Young people from today love watching some meaning movie about education . Like Triumph In The Sky , Line Walker , …..I loved Kevin ‘s acting but I’m not watching this unreal drama. What a pity. Young people from today loved watching movie or drama with good education , good job , hero but real , beautiful love life with true love , bright future and bright hope for good life. I dont think watching series could make a brighter future for young teens and so forth… its basically up to us grown ups to show and teach them…cant really count on the tube to teach em now…….. If TVB don’t want to follow all the bad step from ATV , hope they will continue in their business . That why I did’t like about ATV . Most the drama was so untrue , so fantasies .,. . So many years And now ATV didn’t had enought money to pay for their employees. What a wrong way for making money through a lot of bad drama like that.This life is so hard enough for the young people with the stress from work , from study , from try to making money to survive their daily life , why should they keep watching all the drama or movie so mean less like that. Why a lot of actor and actress from ATV moved to TVB lately ? Because TVB still had some good drama real and much better than ATV. “her only remaining power is the ability to revive the dead for one minute,” since when vampire can bring the dead back to life??? Pushing Daisy anyone? lol. A vampire forensic scientist who can revive the dead for one minute, no less. Who needs science? At least there are no long-lost estranged siblings, or one pair of vampire-undead siblings. TVB’s sorta late to this genre, and it just sounds like a stretch. Hope they won’t botch the special effects. Oh don’t say never! You never know!! Science? Science is needed to revive the dead for more than 1 minute. She is a vampire isn;t she? She already has the key to reviving dead for more than 1 minute. Bite them and since there is no repercussions to being a vampire (live forever, young forever, no sunlight to burn ya, blood craving) why not eh? Oh yeah Vampire can’t revive the dead but can turn an almost dead! But then since they don’t burn in modern versions (rubbish!) why not just break another rule? The trailer i saw, the special effects is even worse than the A Date with the Vampire series. TVB did Return of the Vampire 大頭綠衣鬥疆屍 (Sammi Cheng acted in TVB) and Night Journey 僵尸福星 (Daniel Chan acted in TVB). There’s another one I think Eternity 千歲情人 (Faye Wong acted in TVB) – can’t remember if it is about vampires or not. its not easy to say,but im really looking for this one,the story and cast seems promising,especially angjaylia,grace and luk wing. Looking forward to this. It has a refreshing plot. It has been a while since TVB has made anything fantasy-related. The cast doesn’t look too bad either. Although I am quite worried as TVB’s recent productions haven’t been very good. interesting new plot line!! Hope it comes out to be what is stated. It’s been awhile since they made a vampire drama. This however does not interest me but i’ll watch it. So they going to shed blue blood when injured ?? this reminds me of another show that was on ABC years ago where the main character would solve mysteries by awakening the dead exactly for 1 minute…. Looking forward to seeing Kay in a TVB drama!